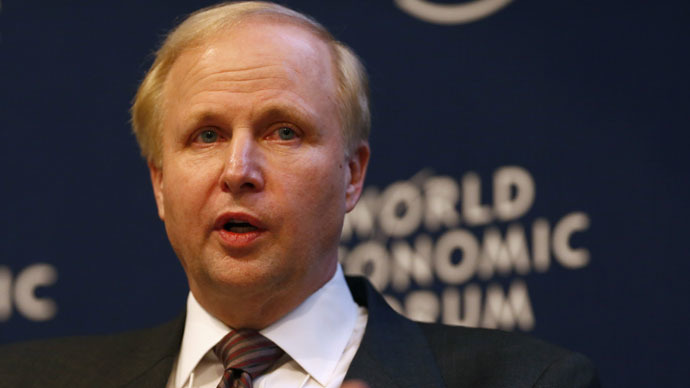 Oil giant BP is going to continue its 25-year cooperation with Russia, and is considering additional investment despite sanctions and low oil prices, said the company’s CEO Bob Dudley. "We have a long-term strategy In Russia, and it has always been so. This year marks 25 years of our work in Russia,” he said. “Our investments have been successful, although we sometimes faced difficulties, but overall it was good for us," said Dudley Tuesday as quoted by TASS. Dudley also talks of the "good relations" with Rosneft in which BP holds a 19.75 percent stake, saying that both companies share a common strategy. He rejected the idea that BP could abandon cooperation with Russia because of sanctions and the falling ruble. "Our strategy is exactly the same as it was. And we want to do more than just be passive shareholders. So far it’s better to speak carefully, but we can consider additional investments. There may be new opportunities," said Dudley. In a separate interview with Bloomberg TV Bob Dudley said low oil prices have a much more serious effect on the Russian economy than Western sanctions. He said if trillions of dollars of wealth are going to be transferred from oil producing to consuming countries in 2015, it would be a good thing for developing countries such as India, China, Indonesia, and a good thing for Europe, but a great stress for oil producing countries. At the same time Dudley believes sanctions won’t bring a result as they need to be clear and well-defined to achieve the objectives. “I don’t think they are particularly effective, I think they become somewhat personal and I don’t think that’s the right thing, actually,” he said. He compared the situation in the oil market to 1986, when the price of a barrel drooped from $40 to $9, but said that the price range is "not so bad" for his company that focuses on a price of $50 per barrel. However, BP has reduced capital investment by 20 percent for 2015. "The price of oil will remain low in the near future," said Dudley, adding that the recovery of prices will take a lot of time. He recalled the words of OPEC president Mohammad el-Badri who said that oil prices can skyrocket to $200. Although the situation in the oil market has often been unexpected, the prices are unlikely to reach even $100 in the short-term, Dudley said, adding that el-Badri more likely referred to high price volatility rather than its rapid recovery.